A cat has been timid since kittenhood. Now 8 years old, she’s suddenly become so terrified she won’t come out from hiding. What could have caused it, and what should her humans do? Here’s what my daughter, trainer Mikkel Becker, and I teamed up to tell a reader. Q: We adopted our 8-year-old female cat when she was a kitten, and she is an indoor-only cat. She has always been somewhat timid and easily frightened by loud noises. Last week, we couldn’t find her; we finally discovered her hiding behind the couch. At first, I thought she might be sick, but she acts normal as far as eating and using the litter box. She seems to have been terrified by something. She spends almost all her time in the basement and won’t go into our bedroom. This is abnormal. She used to cuddle with me and would run to the door when we came home. We have no other pets. Can you give me some ideas on how to help her return to her old self? A: Although your cat is eating normally and using the litter box appropriately, she could still have an underlying health problem. Her abnormal behavior may be her way of telling you that she doesn’t feel right. Any time an animal has a sudden change in behavior, whether it’s eating more or less than normal, breaking housetraining or acting fearful for no apparent reason, it’s a good idea to have your veterinarian check for health problems. Have there been any changes in your home environment? Visiting guests? Remodeling? A child off to college? A trip? Cats generally like things to stay the same. Many cats adapt to change with little problem, but cats who are already timid may have a more difficult time with it. 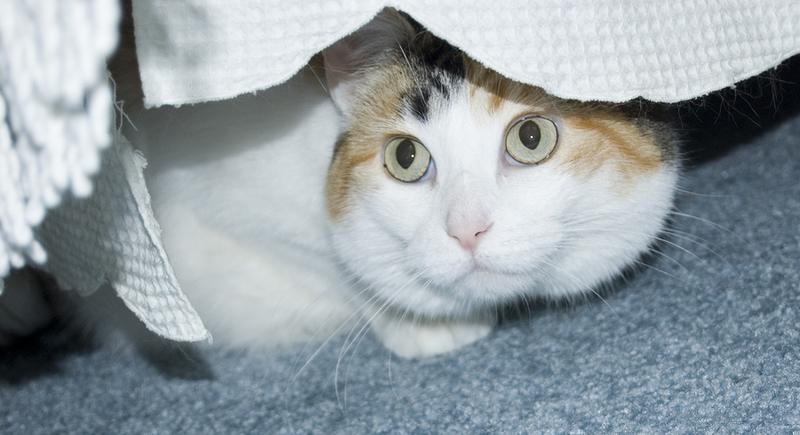 Another possibility: Is an outdoor cat coming around your house? Even if that cat can’t get inside, seeing, hearing or smelling him could cause your cat stress or anxiety. Your veterinarian can refer you to a Fear Free-certified veterinary behaviorist for additional help or may have other suggestions to help your cat.